Turn any ordinary serving of popcorn into a sweet treat with this Great Western 17220 frosted caramel popcorn glaze! 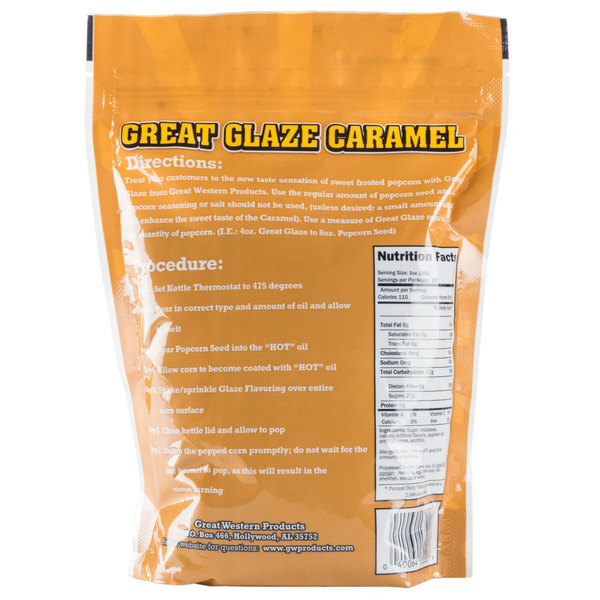 Easy to use, this glaze is sure to keep your customers coming back for more as they satisfy their sweet tooth with rich caramel flavor. It's also an easy way to boost profits and impulse buys at your carnival cart or concession stand! Offer new, tempting flavors and delicious caramel taste when you use this frosted caramel popcorn glaze. To use, allow your popcorn oil 2-3 minutes to heat up, add your popcorn kernels, and then add the glaze last. For best results, add the glaze right before the popcorn begins popping. Use a measure of this product equal to half the quantity of popcorn. It is contained in a 28 oz. carton with a convenient pour top for easy use. 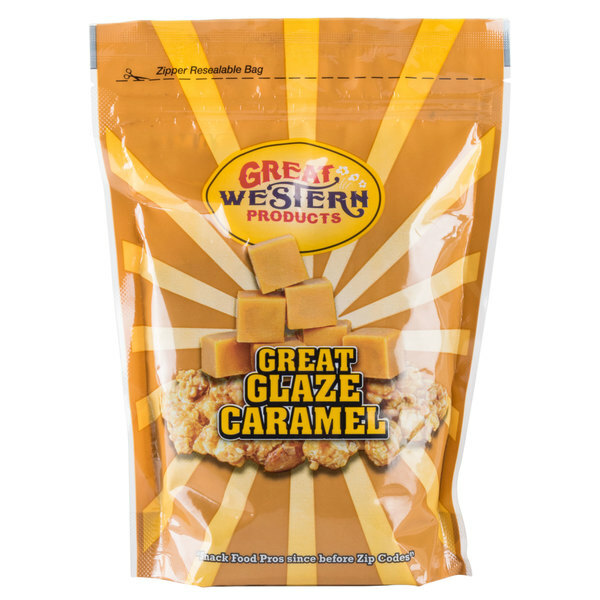 Keep a good supply of this glaze on hand to produce caramel-flavored popcorn that your customers won't be able to resist! My hubby and I ordered the popcorn popper from Webstaurant for our Christmas gift...we love it. My hubby is a caramel popcorn manic so I decided to order the glaze. The only word for this product is "WONDERFUL"
I'm a popcorn addict. I'm not proud. I tend to prefer savory but was looking for a relatively easy way to add some sweetness once in a while. This glaze is...good. Not amazing. But considering how easy it is, I still recommend it. The trickiest thing by far is figuring out when to add the powder; in my oil popper with a stir arm (West Bend's Stir Crazy machine), I add it once kernels have already started popping because any sooner and it burns. In a pan on the stove, it has to go in as soon as the test kernels pop and even so it slows down the overall pop time and leads to more unpopped kernels. 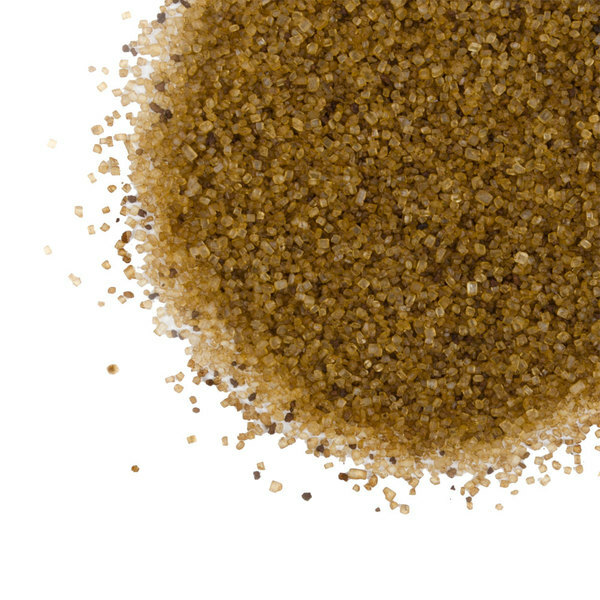 Flavor is a mild caramel, not super dark/strong, and it pairs decently with sea salt. It makes a lovely crispy shell when used correctly. Like any sugar glaze, cleans up fine with lots of hot water. What a great product. We just put this in our regular popcorn machine with popcorn and oil and out pops delicious caramel flavored popcorn. We highly recommend it. This glaze is a great addition to add sweetness to your popcorn. It leave a very light caramel glaze. If you would like a heavier glaze double the suggested amount. There is nothing better than fresh carmel corn! This kind is easy to use and tastes wonderful! Coats the popcorn evenly and not too thick. Will absolutely order more. We actually bought this to use as a topping on some of our frozen drinks in our coffee shop. It has s great flavor and works great for this. My kids love this! What a treat from regular popcorn! And it's so simple to use. I have a recipe for real caramel corn made from scratch but it's a lot of work so I usually only make it a couple of times a year. This tastes great and is super easy! I tried so many times to make caramel corn with this topping, and all it did was burn. I have a stainless steel stovetop popper with a metal rod that stirs the popcorn inside...still burnt. Burnt immediately, both times I tried it. Finally out of desperation I sprinkled this product on top of already popped popcorn and tried to melt it on in the microwave, but not good. Maybe under a broiler it would work? Not worth the hassle for me. It doesn't even taste all that good, and the bag is crazy fragrant. We moved it outside because even when the bag is zipped shut it makes the whole room smell. We appreciate your review, Samantha! We are sorry this popcorn glaze did not meet your expectations, our Customer Solutions team will be contacting you shortly. We tried the butter flavor from Webstaurant before and was extremely happy – it tastes just like the movie theater. So, we decided to give the other flavors a try. We make ours right on the stove top since we don’t have a large professional machine. Just add your popcorn kernels to the oil, and then add the glaze last (right before the popcorn begins popping). You can follow the directions or tweak it to your liking by adding more or less of the glaze. 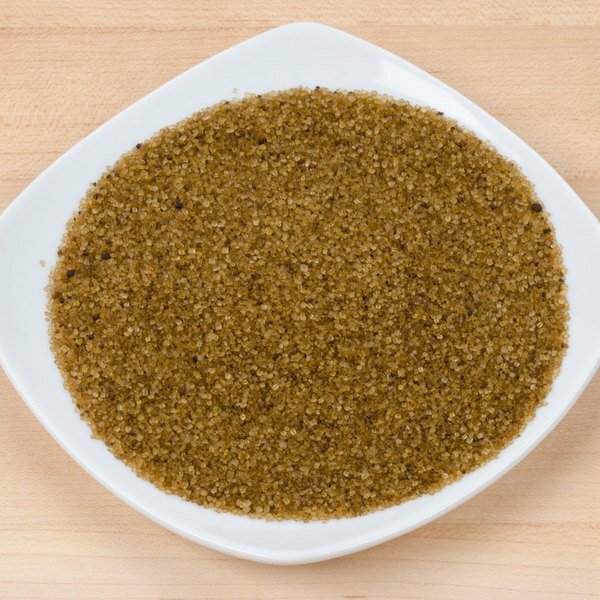 Great popcorn glaze with this product. It is a litte difficult if you do not own a popcorn machine, but nevertheless it works and tastes delicious. This stuff is ridiculous! It is so addictive. The smell is like caramel mixed with rainbows. Seriously everyone wants it after just smelling it. It tastes amazing. This is a forever must to have with us. I highly recommend it. Made this right away as I love caramel corn. Wasn't sure how it would turn out but I was pleasantly surprised. Si, a ly followed the directions and had a nice caramel corn taste. This smells and tastes like caramel and the consistency depends on how much liquid. I wasn't supposed to taste it, just yet. I'd planned this to be part of a gift, it still will be. I jinxed myself into having my second Webstaurantstore shipping mishap. Two of out many liquid products and more isn't bad. 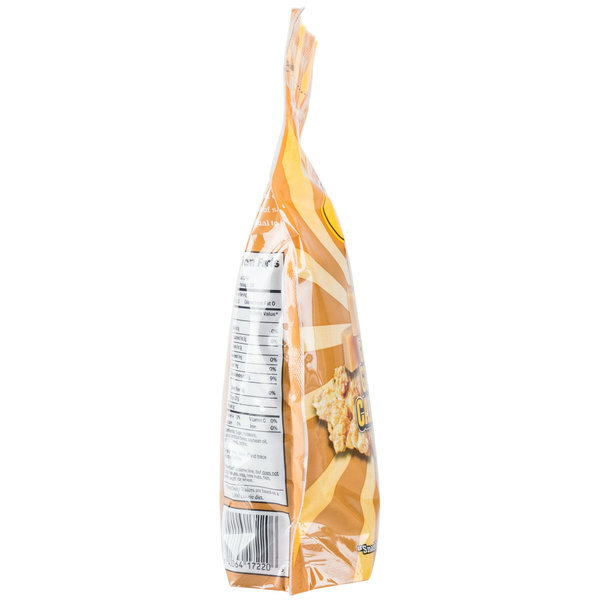 The bag wasn't torn open, the tear here or whatever part was still intact. It didn't have a hole torn into it. The very top had opened, possibly temperature change from warehouse to shipping had loosened the glue or whatever. It could be that it was from sitting in the warehouse but it seemed fresh, as fresh as something like this should be. 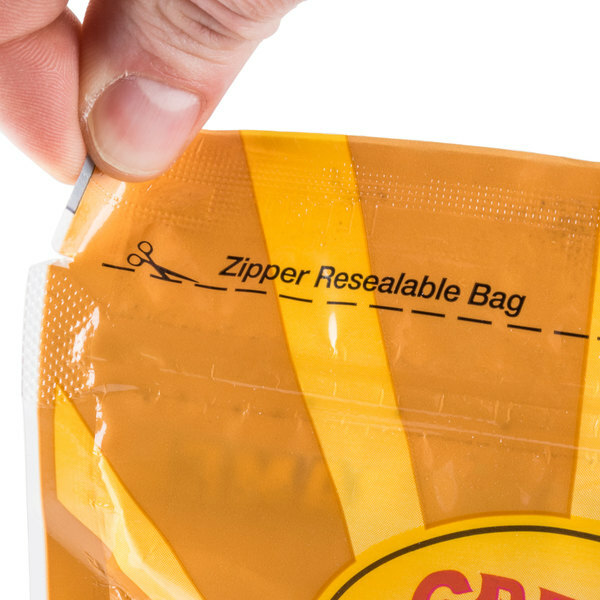 It would have helped if the resealable zipper part had been secured. I secured that and used a heat sealer to reseal the very top. Quite a bit leaked out but not too much so I'll just explain what had happened. I am mentioning this so the packaging department knows what to check for in the future.